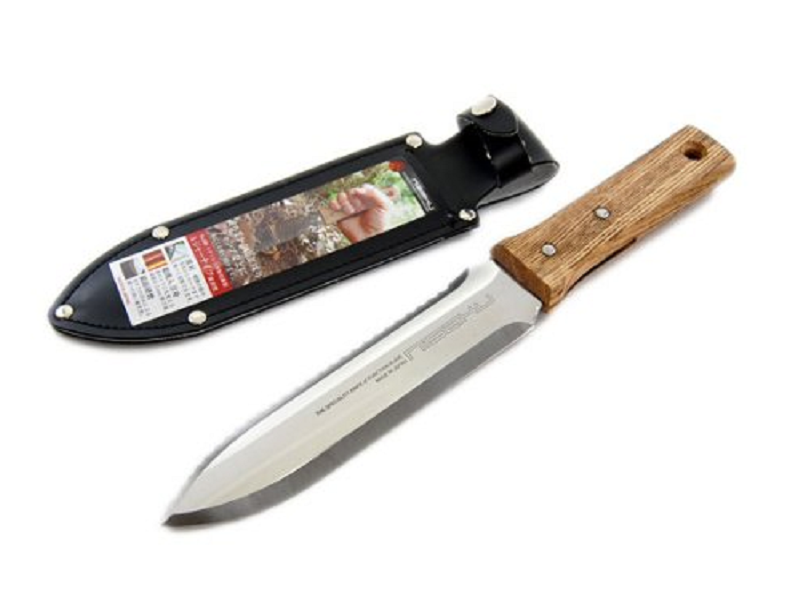 Save when you buy your Japanese gardening knife and leather sheath together. Digging, weeding and cutting are much easier with this high quality landscaping tool from Nisaku/Tomita. 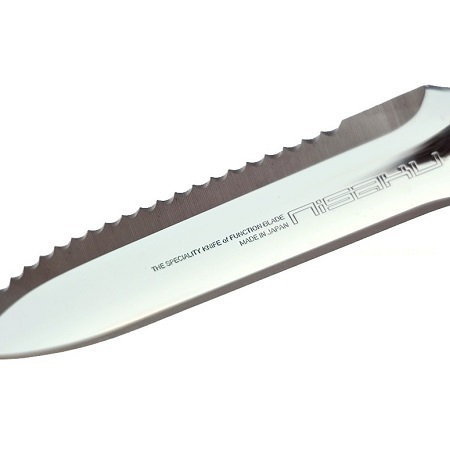 The sturdy, super sharp blade reduces strain on your hands and wrists. The stainless steel blade is completely tempered to increase durability, resist rust and make cleaning easy. 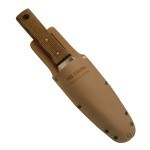 The serrated side lets you saw through tough roots and small branches. 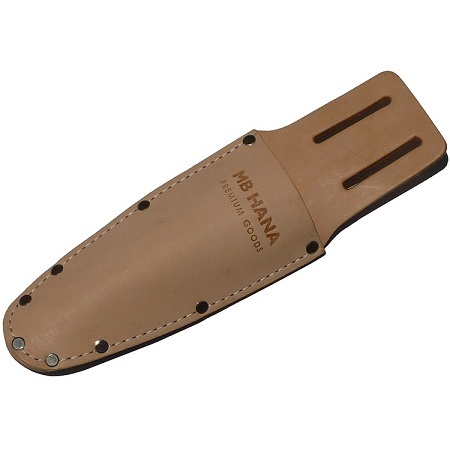 MB HANA's leather sheath is custom designed to fit the Nisaku/Tomita hori hori. 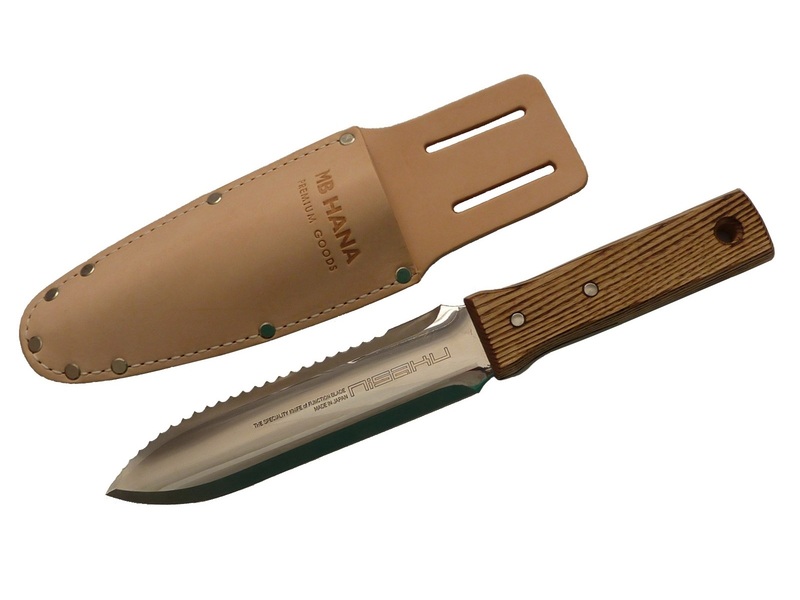 Use it to keep the sharp edges of your hori hori protected and within reach as you garden. 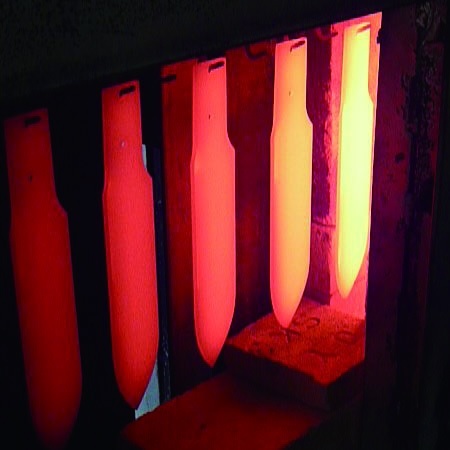 Concave blade for scooping soil is also perfect for mixing in soil amendments. Engraved depth markings help when planting bulbs. Exposed blade is 7.25" long and 3mm thick. to be durable and keep a very sharp edge. They are tough with a corrosion resistant finish. Whether you need to saw or slice, these finely honed edges can handle the job. Use the straight edge to cut sod, divide plants and slice open bags. The serrated edge easily severs roots or small branches. Both edges and the tip are very sharp to pierce tough soil. 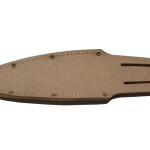 saddle leather sheath. It is custom designed to fit the Nisaku hori hori. pull through and provide extra strength. Slots are sized for 2-inch belts. This quality leather holster is made in California. The Nisaku No. 650 Hori Hori handle has changed a few times during 2015. 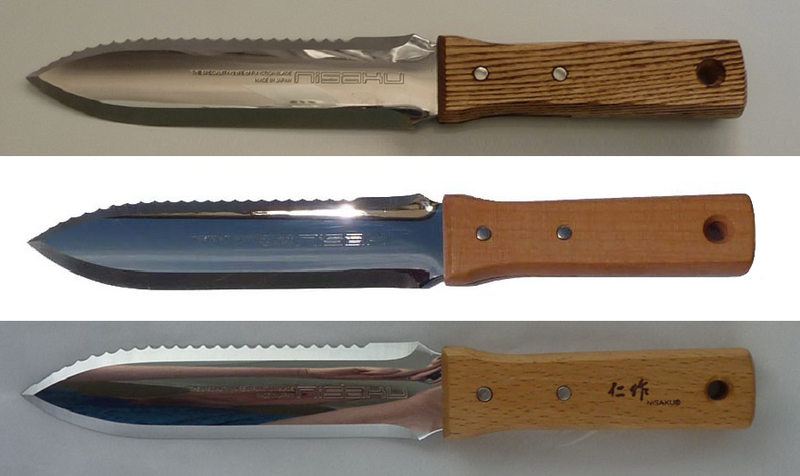 During 2015, hori hori knives became much more popular and factories in China and other countries started producing cheap copies. To make it easier for shoppers to distinguish the higher quality, authentic Japanese-made hori horis, Nisaku added their brand on the handle. You will also see the brand name "Nisaku" engraved on the blade of authentic Nisaku hori horis made in Japan.